Editor’s note: The names of the patients have been changed. Bob worked as a cop for 42 years before he finally eased into a well-earned retirement. His wife had noticed his slugging shoulders, his shuffling gait and his occasional stumble. She begged him to visit a doctor, but he denied there was any problem. Finally, he made an appointment with a physical therapist – who in turn suggested that Bob see a neurologist. Last May, he received the devastating diagnosis. Parkinson’s. Thirteen months earlier, Ed, an attorney who practiced law for nearly four decades in the same county where Bob patrolled, called it a career. Retirement had come seven years after Ed strangely began to lose his voice every afternoon. Around that same time, he saw his handwriting getting smaller. His law partner, whose father had suffered from Parkinson’s, urged him to get it checked. 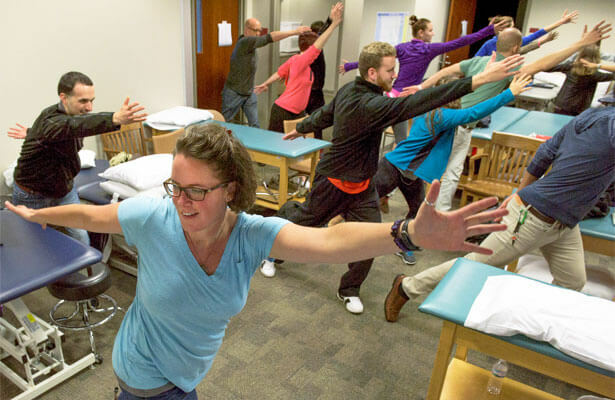 The two men, who are in vastly different stages of their journeys with Parkinson’s disease, recently told their stories to 34 physical therapy students gathered around the treatment tables in an NIU classroom. And, as grandfatherly types are wont, they were generously forthcoming and just as blunt. Becky Wagner, academic coordinator of clinical education in the School of Allied Health and Communicative Disorders, invites patients with neurological disorders to the lab sessions where they talk about themselves and demonstrate their mobility. Wagner, a board-certified neurological clinical specialist in her fifth year teaching the clinical experience classes, recently sat on the student side. She holds three degrees from the NIU College of Health and Human Sciences, including a Doctorate of Physical Therapy earned in 2012. 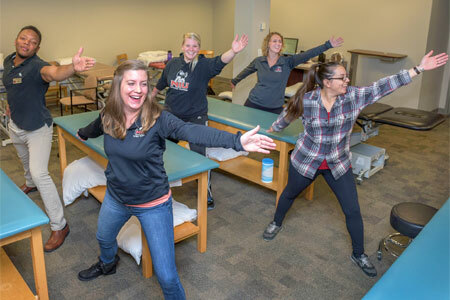 Fully accredited since its inception in 1980, NIU’s program also offers a bachelor’s in Health Sciences with a physical therapy emphasis. “After I graduated, I felt like it would have been great to have had patients come in, see how they moved, talk to them, see how their rehab process was going, and ask what things made a difference for them going through physical therapy,” Wagner says. Other classroom visitors this fall have included people with highly different presentations of spinal cord injuries. In future semesters, Wagner hopes to bring patients with ALS, Guillain-Barre syndrome, neuropathy and strokes. All begin by painting verbal pictures of their daily lives, including their highs and lows, and later answer questions from the class. Depending on their mobility, they’re asked to show how they move around or how they get in and out of their wheelchairs. 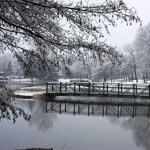 Wagner’s students also will make a field trip of their own this semester to observe a support group meeting. That, too, will provide a real-life glimpse at the physical realities and raw emotions of patients. Becky Wagner (right) works with student Elizabeth Smith. Bob, the former cop, now realizes he had missed some of the hints of Parkinson’s. After receiving a cortisone shot to treat a painful case of bursitis in his hip, he still couldn’t keep pace with his colleagues in law enforcement when they hustled through the police station or the courthouse. Since his diagnosis in May, he’s installed banisters on both sides of the stairwell at home. He’s lost his sense of smell. He’s joined a support group. Fortunately, he’s also become a “gym rat” devoted to exercise and is working out at home as well. His tremors – “never really bad,” he says – have lessened considerably. The disease has stolen his ability to golf and fish. It’s made traveling for vacations difficult. He still drives, but only in town and only during the day. Otherwise, his daughter tells the class, he’s too tired behind the wheel. He already wrecked one car. People in public places often try to help him, Ed says, maybe by opening a door or manually helping him through an open door when they notice that he’s “frozen up.” Those well-meaning strangers only make him nervous, though. Like Bob, he takes Levodopa, which the brain converts into the dopamine human bodies need to move. Both men also take Carbidopa, a levodopa enhancer. Ed also takes a muscle relaxer in the hopes of calming the spasms that keep him awake at night. Still, he embraces the exercise. in the LSVT BIG exercises. 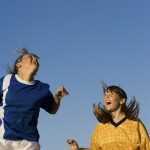 The main exercise program Bob and Ed have undertaken is called LSVT BIG, developed specifically for people with Parkinson’s to improve balance, coordination and range of motion. Their doctors recommended it; Bob also heard about BIG from his wife, who found it on a Google search. 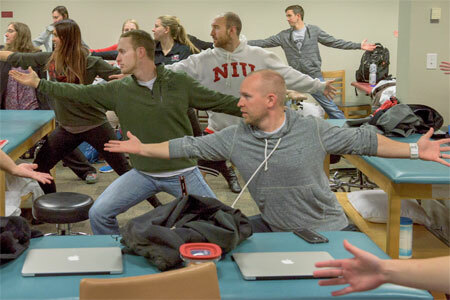 Wagner’s NIU students know it, too, and all join in to perform the moves as guided by a DVD projected onto the wall. First, they stay in the chairs, reaching forward and down to touch the floor with their hands before raising their arms toward the ceiling. They hold that stretch while they count to 10 in loud voices. They then turn from side to side, extending their arms and sometimes wiggling their fingers. Next, it’s time to pivot in the other direction. Once they’re standing, they step forward and reach out. They step to the side and reach. They step backward and reach. They rock and reach. Soon they’re back in their chairs, but not for long. The DVD instructs them to put their hands on the floor but then stand as they reach their arms upward. And when the students begin to sweat and groan from the vigorous workout, Wagner quickly turns those complaints into a teachable moment. “Now we know how our patients feel,” she says. “We learn a lot in class from our professors but there is absolutely no substitute for first-hand experience and stories from individuals who come to our class,” student Karyn Kolner says. “It is extremely difficult in our lab sessions to attempt to demonstrate the physical deficits that we will see daily as professionals. We get limited opportunities throughout our program of study with our clinicals,” Jonff says. Real patients who visit Wagner’s classroom also are encouraged to share their opinion on physical therapists. For Bob and Ed, the impression is a positive one. Physical therapists understand what patients are going through, they says. Physical therapists provide the most practical information about the disease, they add, simply because the appointments last a solid hour and the ratio between patient and caregiver is 1-to-1. Neurologists don’t enjoy such a luxury of time and, Wagner tells the class, those precious and unhurried 60 minutes allow physical therapists to chat, evaluate and learn. Her students, meanwhile, are getting an early peek at those interactions. Students also learn what patients want from their physical therapists. Both men say they are grateful for the chance to tell their stories to the next generation of physical therapists, all of whom are probably the same age as their grandchildren.